Now Doctor Who fans can be warm and comfy all thanks to this 13th Doctor Portrait Hoodie. The Doctor Who hoodie comes in black, navy blue, red, and white and is made from 10% polyester and 90% cotton. 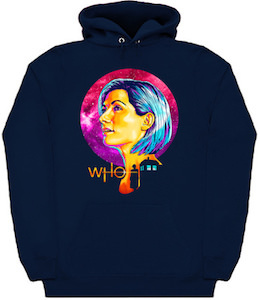 On the hoodie you can find a purple circle in the background which could be a planet and on to pot that you can find the portrait of the 13th Doctor and below her head you can find a part of the Doctor Who logo that says “Who” and next to it you find a silhouette of the first female Doctor and the Tardis. You can get this cool Doctor Who hoodie in sizes Small – 2XL and it will look great on both men and women. And if you like you can get this Doctor Who design on a t-shirt too. If you want people to know what Tardis stands for then you need this Time And Relative Dimension In Space hoodie. 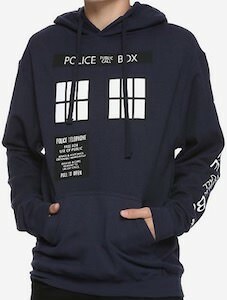 The hoodie is Tardis blue and has grey sleeves and a hoodie and on the front of the zip of hoodie, you can find a small image of the Tardis. 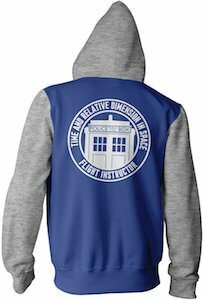 On the back of the hoodie, you see a circle within it the Tardis and around it, you find the text “Time And Relative Dimension In Space Flight Instructor”. The hoodie is available in sizes Small – 2XL and is made from 60% cotton and 40% polyester. So if you want a cool Tardis hoodie then you just need this. If you always wanted to be part of the Cybermen army to deleted some humans then now you can feel and look like one by simply wearing this Doctor Who costume hoodie. This men’s hoodie is special as it not only looks like the costume of a Cyberman it also has a hood that zips up all the way to the top making it looks like you are wearing a mask and that makes it look even more look like a real Cyberman. Of course you have to be a true Doctor Who fan to enjoy wearing such an amazing hoodie. You can get this hoodie in men’s sizes Small – XL and will make you like a true Cyberman robot.